CableWholesale offers a vast selection of HDMI products including HDMI cable adapters, high speed cables, switches, and other components. Since HDMI (high-definition multimedia interface) is the current standard for connecting high-definition devices, you won’t get very far hooking up your HDTV without it. You can use our HDMI cable adapters and other accessories to experience 3D as well as 1080p and above imagery, surround-sound audio, 4K, and other audio and video technologies. HDMI products are also preferred because they allow for the transfer of digital audio and video in a single cable. This makes them ideal for use in for seamless, in-wall applications. Our wholesale HDMI cables are designed for quality and performance. Need bulk HDMI cables for large configurations and commercial applications? We have what you need. Have a high-speed application? No problem. We have HDMI Ethernet cables, extension cables, and micro HDMI cables. We also have a variety of in-wall and plenum options that are specifically designed for fire-safe use in plenum and wall applications. These cables meet the latest HDMI specifications set by the HDMI Standards Committee. At CableWholesale, we also offer connectors and adapters for use in various applications, including TVs that need to be converted to mini HDMI, DVI, and other connector types. Our large selection of HDMI products includes HDMI to DVI cables that can be used to connect to a DVI-D or DVI-I digital flat panel, DVD players, projectors, and more. If you want to run uncompressed HD signals from source devices to a TV up to 100 meters away, pick up one of our HDMI extenders. 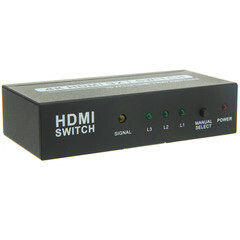 To maximize your connection options for your HD devices, check out our selection of HDMI switches.